but the flowering phase is slightly different. Up to now, the opening ceremony of 2017 Nyingchi Peach Blossom Festival has not been confirmed by the official. Please contuct us for more details. and then Zayu County, Bayi District, Mainling County, Nang County, Gongbo'gyamda County. The most significant feature in Bome peach blossom lies in the large size. Favored by Pallong Zangbo River,Bome peach flowers are exceptionally brilliant. Wonderful viewing points: Galang Lake/Runa Village, Qingduo Town, Xumu Township, Songzong Town. Classic travel route: Bome Town-Runa Village-Qingduo Town-Xumu Township-Bome Town-Songzong Town. Runa Village is 32 kilometers away from Bome Town. When driving through G318, you can appreciate lush peach flowers clustering on the river banks. a panoramic view of peach flowers and Qingduo Temple. blossoms at the second half of March. you will be indulged in the Niyang River cruise. Wonderful viewing points: Gala Village, a typical peach village, is 17 kilometers away from Bayi Town. Classic travel route: Bayi Town-Gala Village-Kasimu Village-Daze Village-Nichi Village-Gala Village-Bayi Town. Note: Peach trees in Gala Village often put forth their blossoms about March 10th. 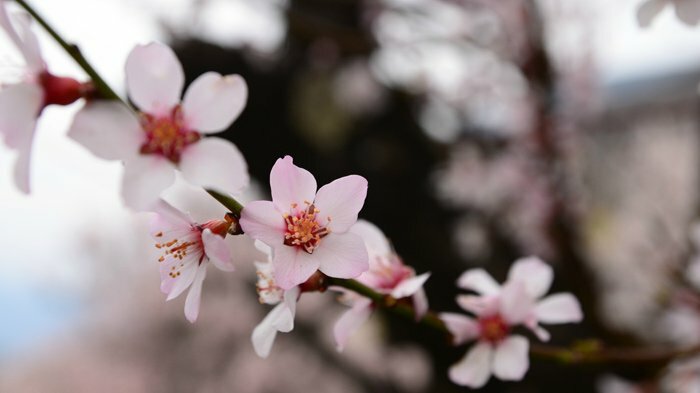 After reaching the peak around March 18th, peach blossoms begin to fade away at the end of March. The full-blossom period in Gala is much longer than other places. floating on the river. Here is the paradise of peach blossoms. 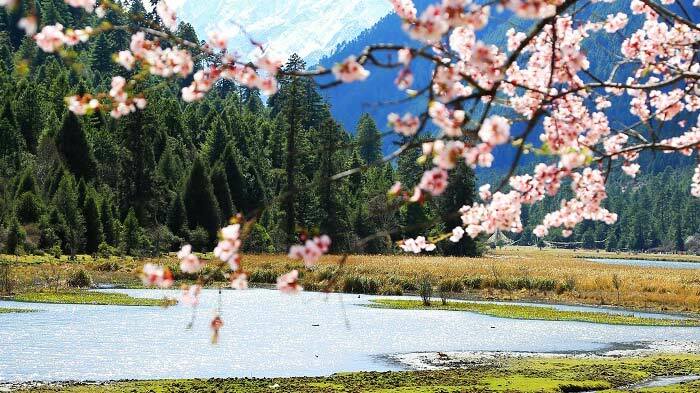 Located in the Brahmaputra Grand Canyon Scenic Spot, Suosong Village is the best point to take great shots of majestic Namjagbarwa Peak and brilliant peach blossoms. 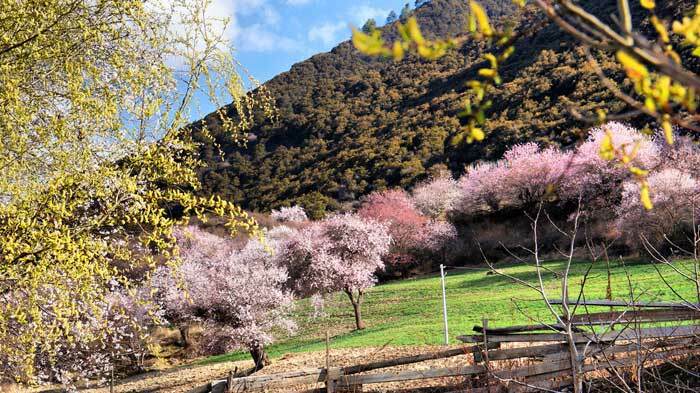 Located 10km away from Suosong Village, Daling Village is home to boundless pastures and tens of thousands of peach trees. How romantic it is to see rosy petals dancing in the soft breeze. villages pass by,it seems like you can reach out to the peach flowers on the riverside. At the foot of Namcha Barwa Mountain stands a heat-shaped stone. The boulder was split from top to bottom. But the amazing thing is a peach tree has sprouted from the crack. There is a romantic love story about this fantastic landscape. The peach tree has miraculously thrived from the crack. Once upon a time, Shouduo, a king of peach tree, has two daughters. They fell in love with a youth Anida who begged for a peach from Shouduo to treat his mother's disease. Rama used her magic power to trap Rami under the boulder. Thousands of years later, Rami has already turned into dust, but the peach tree miraculously bursts out of the stone. Don't forget to circle peach tree clockwise three times for everlasting love. Note: The temperature in Nyingchi-Mainling Highway and valley areas is much lower. The flowering period usually starts from March 12th. It reaches the best around March 20th to April 5th. Peach trees along Mainling to Nang County are more peculiar than other places. Some grow on the sand dues, some on the tough cliffs, and others on gorges. are clustering along National Highway 318. 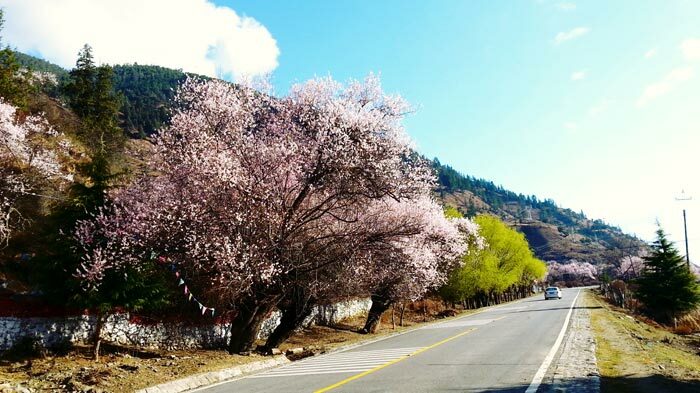 30km away from Heba Town, Laru Village treasures a great number of peach flowers in Gongbo'gyamda. We highly recommend you to come here in the middle of April for the best views. Known as "the paradise on earth", Basum Tso Scenic Spot is home to snow mountains, turquoise lakes, primitive forest, roaring waterfalls, natural pasture, religious temples and cultural heritage relics. 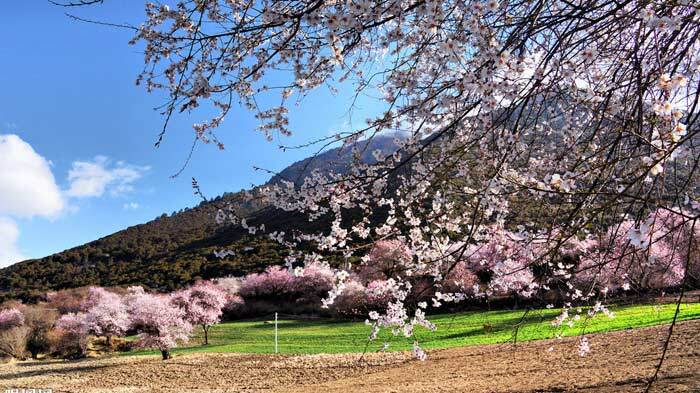 Jieba Village, built by the Lake Basum Tso, is also a good place to enjoy peach blossoms. You can also pay a visit to Xiuba Village, 75km away from Bayi Town. Here you can not only appreciate rosy peach blossoms but also explore the Xiba Ancient Castle. 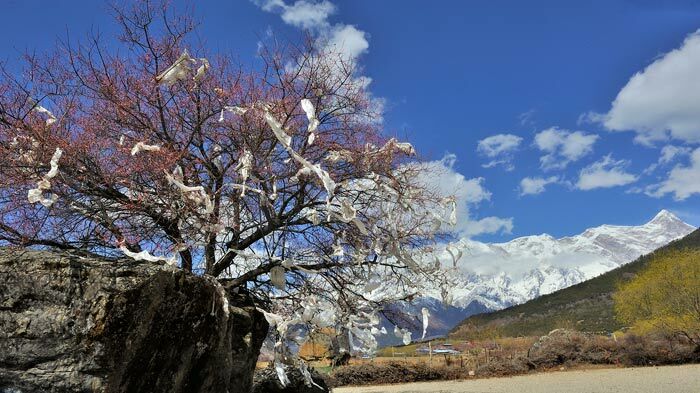 Note: Since Gongbo'gyamda has an average altitude of 3,500 meters, the flowering period starts much later than other places. Peach trees often begin to bloom around March 25th. The full-blossom period lasts from April 5th to 30th or so. In addition to massive peach blossoms, you can also take part in cycling competition, enjoy the hot springs, and try some local delicacies. Now, let’s check out some highlights of Nyingchi peach blossom festival. Arrive Shangrila and take welcoming dinner in the Shangrila Old Town. Sunrise of the Meili Snow Mountain and burning cypress branch to the holy mountain as tibetain people's pray way in the morning. visitors to this isolated region. We will visit the 99 bens of Nujiang road and going to cross the Nujiang(Sarwen) river gorge to arrivel Pasuo town. Gawalong Lake, Glaciers, going pass the forest downto the Motuo with tropical rainy climate. 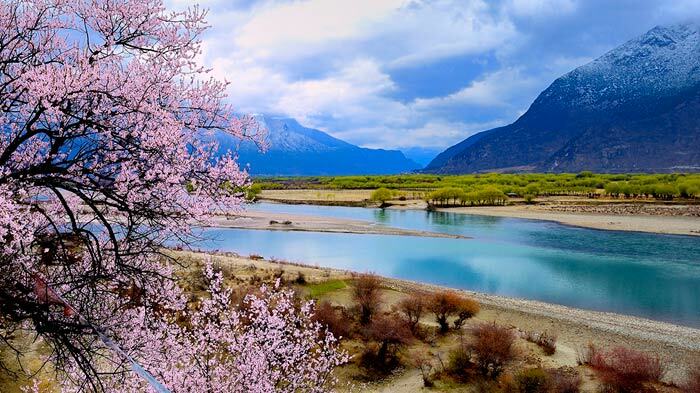 we will driver father down to the yarlung zangbu gorge to seek for the wild plants, birds and gorge view in the afternoon. and gona take free photography of peach flowers in Tsongduo tibetan village. We will take photos of peach flower in Peach Flowers valley at Xvmu village and then crossing Serkhyim La (4515m) and the Parlung Tsangpo, the trail now follows the upper course of Brahmaputra. The landscape now is now virgin rain forests. Arrive at a small forest settlement where the Yi’gong Tsangpo and Parlung Tsangpo rivers converge.We then rise to high altitude terrain again crossing several 5000m passes with endless outstanding views. Just south of road into Linzhi is Mount Bönri (4671m), highest of 3 sacred Bön peaks on the north bank of Brahmaputra. It ranks along with Kailash as the most sacred pilgrimage peak of the Bön religion. Linzhi (3000m) was the former county capital, now a small town on the bank of Nyang-chu, set below Mt. Bönri. Its setting is truly magnificent - primeval forests, plateau lakes, high mountains and deep fertile valleys.